There are a lot of reasons why I love Pilates, and definitely more than 3 great reasons to practice Pilates principles while you walk. While walking can be a fitness activity, it’s also a very necessary daily activity. And HOW you walk can dramatically affect youprir health. It’s great to think that you’re getting a good workout, but that may not always be the case. Are you jamming out with your headphones and not paying any attention to what your body is doing? Or being dragged along at the end of the leash by your very enthusiastic dog? Or because you’re on your feet all day at work, you assume you’re getting in a lot of “steps” and that this is helping improve your health? How often are you experiencing annoying aches and pains by the end of the day? I was chatting with a client today, and she said, “My hips always hurt. They’ve hurt for a very long time. I just figured that I have to accept it, they’re always going to hurt.” So I asked, do they hurt more or less since you started Pilates? “Less” she said. And then we looked at the skeleton together to discuss how her posture and muscle habits have contributed to her hip pain, and how, by continuing to practice Pilates principles, I believe her hip pain will continue to diminish. We are not supposed to live with pain! Pain is a signal from the body that something is not quite right. Learn to listen, and find the right strategies to take care of it, and chronic challenges can go away. One of the easiest everyday activities we do is walking. Learn to walk well to reinforce healthy habits. 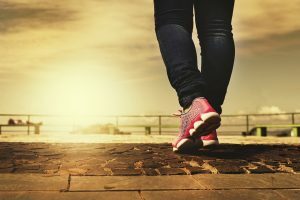 Walk without connecting mind and body, or finding, feeling, and using the right muscles for a healthy stride, and you might be increasing the potential risk of injury, or having to deal with chronic aches and pain. Pilates is more than just a workout. It’s a fundamental way of approaching how you can use exercise to improve, enhance, and maintain better whole-body health. I consider Pilates exercises and equipment training the be tools which are used to connect mind, body, and movement, so that what clients learn in the studio they can begin take out the door with them and put into practice throughout the day in their everyday life. After all, a couple hours of exercise a week, will never completely undo all the bad habits;, slouching, poor posture moments, or muscle imbalances, that folks have developed over time that end up leading to chronic aches, pains, and injuries. By applying what you Pilates Principles to how you stand, sit at your desk, drive your car, walk, run, bike, swim, golf, dance, vacuum, sit down on the toilet, climb stairs, lift a laundry basket… whatever the activity – your body can be in an everyday state of continuous improvement. Why not reinforce the awareness of how to find, feel, and use the right muscles to stay healthy all the time, not just during your workouts. I’m super-stoked about my new book Pilates-Walk: Tips, Techniques, and Exercises for a Healthy Stride, because walking is one of the best fitness activities you can do outside of the studio to put into practice everything you’re focusing on during your Pilates workouts. Posted by administrator in Pilates, Walking. I’m super-excited to announce that after YEARS in process, my book Pilates Walk™ Tips and Techniques for a Healthy Stride is finally available. Learn the system I use with my in-studio clients and have been teaching for years at Pilates-Walk workshops to improve gait and get everything from your head to your toes integrated, coordinated, and working well, to maximize the health benefits of every step you take. Walking provides a great whole-body workout, but only if you’re using everything well. Most of us have muscle habits that are inhibiting our stride. Whether it’s from siting at a desk all day, muscle imbalances from sport training, being a mom and carrying your kids on one hip all the time, past injuries, or just lack of awareness for what muscles you’re using to move… Becoming more aware of your current habits, and discovering new ways to move with the Pilates Walk system, can help you fine-tune your fitness for an even healthier YOU! It’s nice to think that you’re out for a walk to improve your health, but if you’re not engaged with both your brain and body to pay attention to how you’re moving, you might be missing out on the true health benefits your walking workouts can provide. Learn Centerworks® M.O.V.E.ment concepts designed to integrate mind and body. Experience simple Pilates Walk prep exercises that will help you retrain each part of your body to improve your healthy stride. Find the support you need to stand taller, engage more muscles, and move with freedom and ease. Discover how much more of a whole-body workout you’ll get while walking by incorporating the Pilates-Walk training principles, concepts, and exercises into your weekly workouts. Whether you walk as a dedicated fitness activity, or just walk as a part of your daily life routine. Improve how you move with Pilates Walk Tips, Techniques, and Exercises for a Healthy Stride. No Pilates experience necessary to benefit from the tips and techniques you’ll find in this book. Use this resource on your own at home and start putting these easy-to-learn Pilates Walk techniques into practice during your walking workouts. 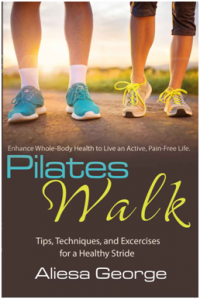 Order your copy of the Pilates Walk™ book today! Centerworks Pilates workshops for teachers are designed to help you make a great investment in your continuing education. Walk, run, drive, or fly on down to Centerworks Pilates and discover how the Pilates-walk training program can help you teach your Pilates clients to walk well and improve body mechanics for better gait. Register today for this 2-day Pilates-Walk Training Program Workshop and “walk” away with skills that will enhance your expertise. After the Pilates-Walk Workshop you will understand what to look for in your clients gait habits that can be improved, and how to utilize what you see to make smart exercise choices that can help Pilates improve gait. Explore concepts for better body mechanics, and fine-tune Pilates exercises on the Mat, Reformer, Cadillac, Chairs, and Barrels that are most helpful for training a healthy stride. Mindful “Pilates-walk” training habits help connect brain and body to the important benefits of practicing Pilates principles in the studio and during walking workouts to reinforce healthy movement habits for a healthy life. This 12-hour Centerworks course includes hands‐on learning and practice and is pending approval for CEC Credits through Pilates Method Alliance. Get Details and Register NOW! Posted by Aliesa George in Walking, Workshops. Posted by Aliesa George in Flexibility & Stretching, Running, Walking. Stretching the calf and soleus muscles are important for your lower leg and ankle flexibility, but just doing a plain old calf stretch probably isn’t going to dramatically improve balance because it is not the flexion and extension of the ankle that needs improvement as much as the lateral side-to-side strength and support. What can you do to improve balance? There are thousands of opportunities throughout the day where we have a moment to practice standing on one leg and balance. Can you guess where your top two opportunities to practice balancing on one leg are? Posted by Aliesa George in Foot Care & Foot Fitness, Running, Walking. How Are You Working: Legs turned Toe-Out, Parallel, or Pigeon? Little, seemingly insignificant posture habits can set you up for problems, pain and injury. And what is interesting is the fact that your heels and ankles might not be the weak link that is setting you up for a potential problem. What do I mean by this? Part of paying attention to leg alignment is knowing what is happening at the feet. A toe-in, parallel or toe-out stance or gait pattern can dramatically change how the feet and ankles work and affect the stress placed on your knees and lower back. As a result of your everyday foot fitness habits, the muscles that are strong or weak in your feet and lower legs can be your own unique posture challenge. But half of what you need to pay attention to might be the direction of the feet and the other half is what’s happening at the hip. 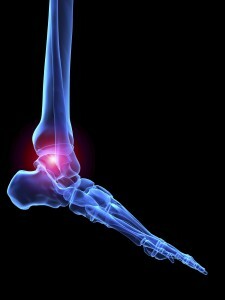 Posted by Aliesa George in Flexibility & Stretching, Foot Care & Foot Fitness, Running, Walking. There are lots of things you can pay attention to when you walk and run that can improve your pace, stride, form and function. A great arm swing is one of the key factors in not only freeing the arms and shoulders, but also strengthening your core support and reducing stress and tension in through your whole spine. If your back hurts after a long walk or run or you notice more tension in your neck and shoulders before, during or after getting your miles in, there’s a good chance you’re missing out on the important “spiral effect” of the spine while you’re swinging your arms. It’s interesting to observe bodies in motion. And sometimes, seeing what to look for, can make it easier to feel in your own body exactly what your movement habits are. Posted by Aliesa George in Back Pain, Exercise and Fitness, Running, Walking. This article is Part 1 in a 3-part series on Healthy Feet: Heel Mobility for Better Balance and Body Control. A really important task that our feet provide for us is balance. 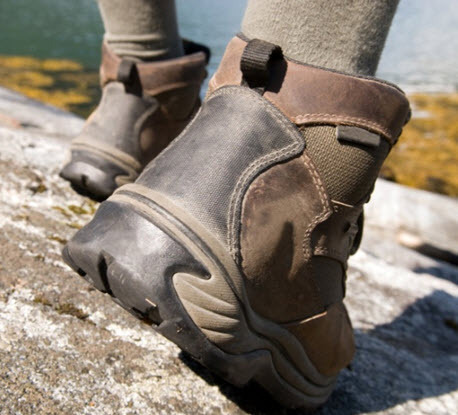 Our toes individually grab and release the ground for stability, the ankle allows us to shift our weight without toppling over, and the foot (between the ankle and the toes) can be strong and rigid or pliable to adapt to different terrain. The foot is almost shaped like a triangle, wider for more support across the forefoot and the toes and supported in the back at the heel. Instead of thinking about the heel as a single point, (like one leg on a three-legged stool) the ankle and heel allow for mobility of the foot which means you can be centered on the heel, stand more towards the outer heel or bear more weight towards the inner heel. This medial / lateral heel mobility is critical for balance and keeps us from straining or spraining an ankle when walking or running on uneven ground. The key concept here is medial / lateral heel mobility. Good health starts from the ground up! Whether you walk or run, taking good care of your feet is an important part of any wellness program. There are lots of quick & easy foot care exercises you can incorporate into your workouts to help improve your posture, body alignment and muscle support for healthy, happy, injury-free ankles, arches, and toes. Posted by Aliesa George in Foot Care & Foot Fitness, Running, Walking, Workshops. Have you ever sprained your ankle? Did it turn into a nagging chronic injury? I recently came across a synopsis of a study that was published in the June online edition of the AJSM (American Journal of Sports Medicine) that shows a correlation between ankle alignment and ankle sprains. Ankle sprains are the most common sports-related injury, and many people develop chronic instability and repetitive ankle injuries.